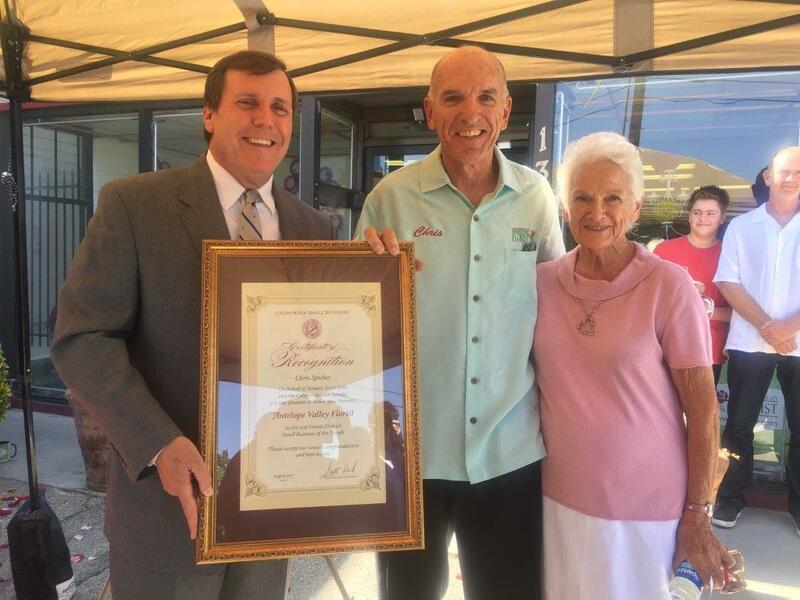 Lancaster – Senator Scott Wilk, R- Antelope Valley, honors Antelope Valley Florist (link is external) as his August Small Business of the Month. Wilk presented AV Florist owner, Chris Spicher with a Senate certificate recognizing the honor at a reception. California is fortunate to have many large corporations call the Golden State home, but the small businesses are what drive the state’s economy. Two out of three Californians are employed by a small business and almost 97 percent of all businesses in California have 49 or fewer employees. These small shops tend to play an integral role in local communities by sponsoring little league teams, participating in service organizations and donating to charity. As a way to highlight the contributions of our small business community, Senator Wilk recognizes a different small business each month. Antelope Valley Florist is the winner for August 2017. AV Florist’s roots run deep in the Antelope Valley. Purchased in 1953 by Chris’ parents, it was at the time, the only flower shop within a 100 mile radius of Lancaster. Chris graduated from AVHS and, after college returned home to help run and eventually buy this family business from his parents. He and his wife, Dr. Lors Spicher, have been active and generous participants in the community. Chris has served as a Toastmaster, Rotarian, Salvation Army Advisor, Lancaster Chamber Director and past President of Antelope Valley Board of Trade. They have raised their family in the AV and remain committed to the community. Currently he is helping Lancaster United Methodist Church rebuild its historic 1964 Moller organ.